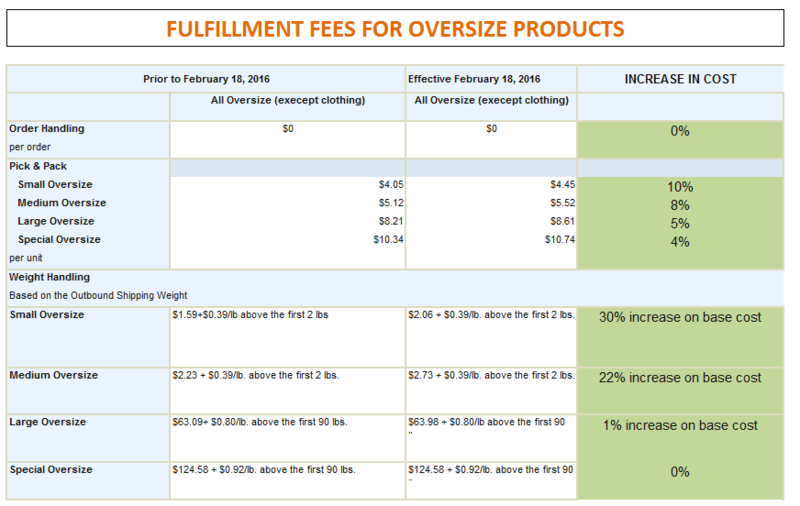 Are You Prepared For Amazon’s Increased FBA Fees? 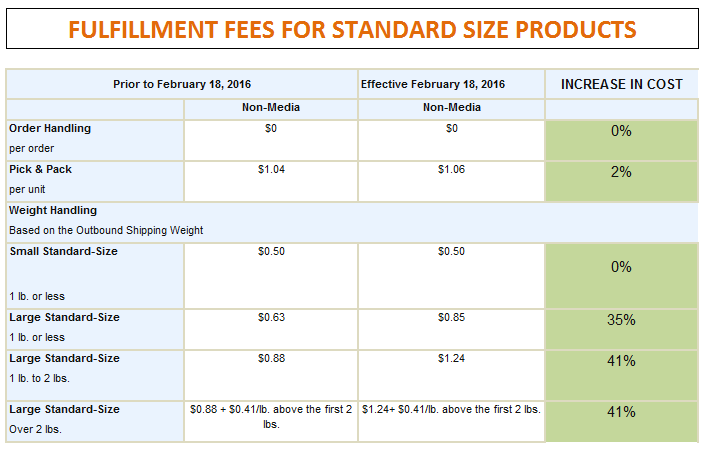 In case you have not seen the notice in Amazon’s Seller Central yet, the Fulfillment by Amazon (FBA) fees will be increasing on February 18th, 2016. This is not the first time that sellers have experienced a price increase by Amazon fees, as just earlier in 2015 there was a similar fee increase. This change is a result of changes in Amazon’s own expenses, which include the cost of fulfillment, transportation, storage, and customer support. Or so they say….of course, this increase in revenue could very well be a direct boost to the bottom line of profit! 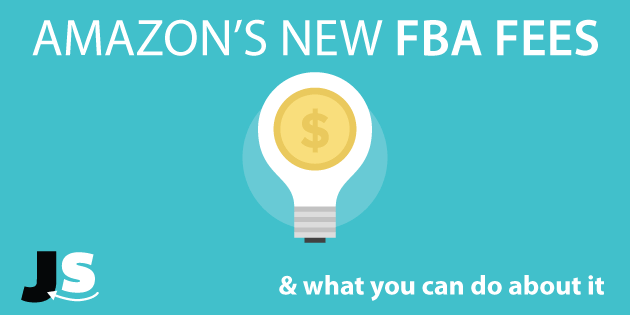 You can see read Amazon’s full update on the FBA fee changes here. How much are these costs going to increase, and what can you do about them? 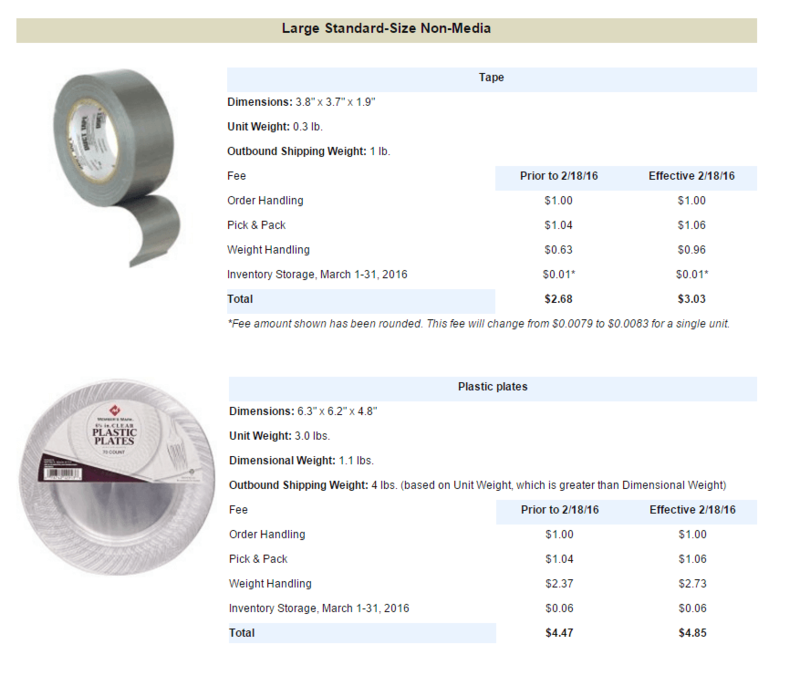 It is interesting to see how the price increases get steeper for as the sizes increases for the Standard Size Products, and decrease as the Oversize products get bigger. One possibility there is that there is a bulk of products that fit that criteria, of either larger Standard Size Products or Small Oversize products, so there is a bigger revenue opportunity there for Amazon to charge more for products in that range. 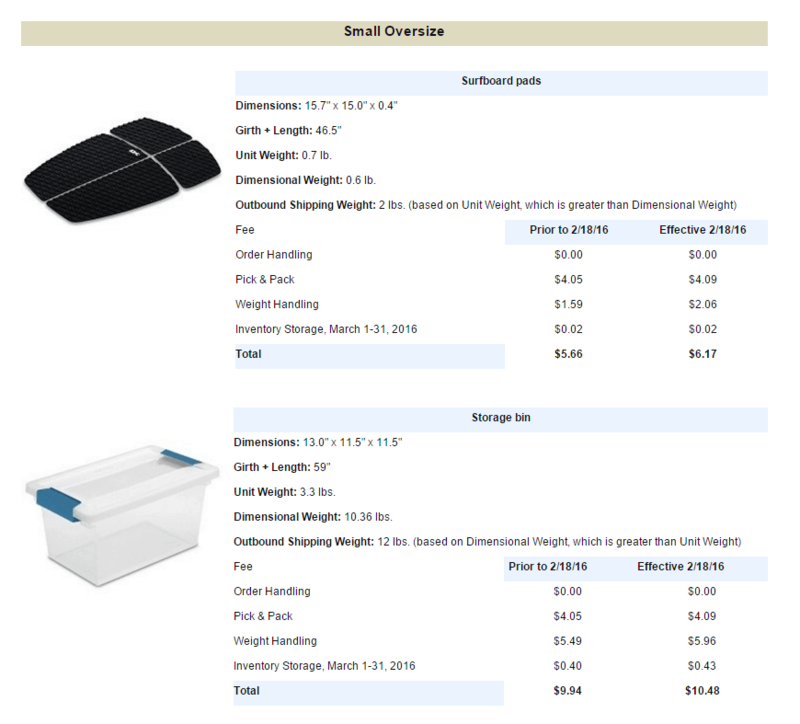 HOW TO ADJUST TO THE FBA PRICE INCREASE? Well, there are two simple approaches to this, as in any increase in any cost you may see in your business: absorb the increase in cost and make less in profit, or pass along the cost to your customers and charge more for your product. I don’t think that there is a one-size-fits-all prescription for this, it will ultimately be your decision, but it is just important to be aware of the costs increases. If you are currently selling your products on Amazon, I don’t think that this should effect your two main priorities, of generating sales (both organic and via Pay Per Click advertising) and customer reviews. I believe that if you have a well-oiled selling machine with great rankings on your main organic keywords, the revenue you generate will more than offset the increase in costs that we’ll see in mid-February. One thing to note: One of the very valuable features of Jungle Scout (both Jungle Scout Pro and the Web App) is the ability to see FBA Fees with your other key Jungle Scout data. We will update our fee calculator along with Amazon’s updates, so you will be able to see what the updated costs are come February 18th, 2016. So when analyzing your profit margins using the Extension, you will still be able to get an accurate (down to the penny) assessment of what the FBA fees are with any given product. Apparently, NET needs to be selected as well. Once NET shows up on the spreadsheet, one then clicks on NET to get the calculator. I didn’t see that in the instructions. Also, my JS doesn’t have TREND. How do I get it? Sorry for any confusion with this, glad that it was cleared up. In order for the Trends to show up, you need to be on the Organic Search Results page, and not a specific product page. So for example, the Trends would appear for “yoga mats”, but not if you were to click on any of the specific results. Does that make sense? Please let me know if it still doesn’t appear. Thanks! I can’t find the FBA Profit Calculator, either. I put in the API keys when I first installed extension. Following the instructions above, I checked the box and was told to add the API Keys again. I did so. Where’s the calculator? Am I missing something obvious? Thanks for the helpful update. I have a question somewhat unrelated but I thought you two may have an opinion. Is amazon trying to nudge private label sellers or what is the deal? I read an article in internet retailer (see link below) regarding Amazon helping chinese factories to sell on Amazon. I was wondering your thoughts on this. In my product research I am seeing an increasing number of obvious listings from factories. Any thoughts? I’m personally not worried about it. In my honest opinion, most Chinese factories are pretty bad at marketing. Have you seen the catalogs they give you? What about their websites? 9/10 of them look terrible. Yes, they may be able to get product to Amazon cheaper than you or I, however, I doubt most of them will be very good at setting up nice listings, doing giveaways to get reviews and initial sales, PPC, etc. All of this stuff is important success on Amazon. On another note, if you were used to selling product at containers at a time, why would selling 1 at a time on Amazon excite you? The same reason that, for example, construction material suppliers that are selling to large commercial builders aren’t interested in selling to consumers. Why would they want to sell 1 board at a time when they’re used to selling trucks full? I also read this on Amazon. I agree that there’s not much you can do about that anyway, so it’s better to spend your engery and focus on getting more sales and more PL products listed. Also, thanks for sharing the videos Greg! Love the video #3 (sourcing in china) and your Canton fair info sharing. I am glad you explained why you need not rely too much on the ‘GOLD Partner’ thing. I am also giving myself the 90 day challenge. I already found 2 products – one that breaks all YOUR rules – hey If i can get that selling then I will have learned some cool stuff. And the other has basically zero competition and the ROI is through the roof!! I found that in like 30 mins on Amazon. Nitin, sounds awesome that you’re going to launch in 90 days, please do keep us posted on the progress! Thanks for this post! It would seem just adjusting the prices of your items to match the updated fees would be fine. Though for some items that cost more, the cost may raise higher. Do you still believe PLing will grow more in 2016? Me and my partner have experience selling from amazon to ebay but private labeling seems far more profitable and scalable! Congrats on your ongoing success hope to learn more from you! I think 2016 is a great year for PL’ing 🙂 I have big plans for scaling up my operations and helping others do the same as well. I have no reason to believe that 2016 won’t be better than 2015! Where is this FBA Fee Calculator which you have an image posted? I JS pro and I’m not seeing this *gold nugget* anywhere. You will have to enter your API Keys in order for the FBA Fees feature to work. Hope this helps!